Ideal for mail, documents, and paperwork. 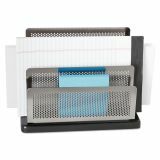 Rolodex Mini Sorter, Three Stepped Sections, 7 1/2 x 3 1/2 x 5 3/4, Metal/Black - Sort messages, mail and stationery in this stylish compact mini organizer. 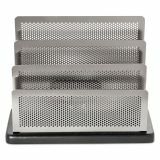 Design features solid wood base, sturdy steel construction and nonskid feet to protect desktop. 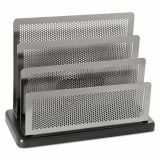 Mini sorter provides easy desktop access for current project files.